★★★★☆ I had waited almost three months for this phone, after learning of it's impending arrival on Engadget. I've now been using it for about 4 weeks, and I thought I'd share some initial impressions. I bought this phone to serve as a home-office phone. I've been working out of my home since September of last year, and I quickly discovered a number of features that were lacking in my old office phone: no mute function (this was the most painful); no wireless (makes it hard to slip downstairs for that second cup of coffee during a long conference call); also no speakerphone. These, then, were my minimal requirements for replacing my old phone. So how does the Uniden improve on my prior sad situation? Well, the mute function is there, and reliable. I'm a little displeased that -- when accessed either from the base station or the handset, it's basically a two-click (software-driven) action to mute or unmute. I would've preferred one dedicated hardware control to mute and unmute. I tend to toggle between the two states a lot -- with two dogs in the house, I can never be entirely sure when I'll need to quickly mute a call. (Squirrel sightings, neighborhood dogs walking by, etc.) Likewise, many's the time when I've been comfortably muted, only to have an on-call colleague throw an unexpected question my way. Two clicks to unmute is one click too many, when each lost milli-second of fumbling makes it seem like you're not following the conversation. So I gotta ding Uniden on that feature. The phone is, of course, wireless. (Rather, the handset is wireless.) The base unit, of course, remains docked to a land-line. As a bonus, the phone operates on the 5.8GHz band, so I expect (and have observed) little to no interference with all the 2.4GHz devices in our house: our (downstairs) home phone; our wi-fi network; our microwave. Within the limits of the base-to-handset reception, reception and sound is crystal clear. So good on you, Uniden! My second cup of coffee is never more than a mute-and-a-dash away. As for speakerphone capabilities, I have to give the phone high points. Especially when used through the base station, the speaker is loud (well, loud when I want it to be -- the volume controls for the base station are well-design and nicely accessible) and very clear. 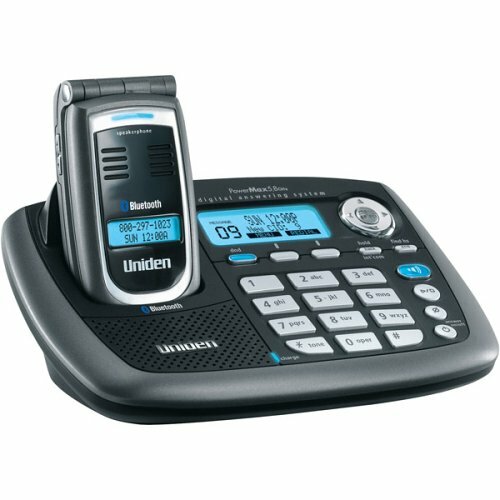 The Uniden handily meets my basic needs for a home office phone. But the really novel Bluetooth feature is what Uniden calls CellLink. It works like this: link your Bluetooth-enabled cell phone (which I unfortunately don't have, as I am trying to eke the last dollar out of my investment in this Treo 600) to the Uniden unit, via the magic of Bluetooth, and you can place calls via your mobile plan (think: free evenings and weekend) but using the far-superior sound quality and stability of the land-line setup. Unfortunately, as I mentioned, I don't have BT on my mobile phone, so I can't vouch for the superior-sound-quality argument. But I can paint a scenario for you that has me excited. Often, when the wife and I are working in the backyard, we've got THREE dang phones out there with us: our home phone, my mobile and her mobile. (Honestly, we are people who are easily able to ignore the world and not take our phones out there. But quite often we're working in the yard and waiting on family to arrive. Seems like whenever we take just one phone, my inlaws will invitably spend the afternoon trying to reach us on the other line! Argh! So picture this: with CellLink (And a pair of new phones for me and my wife, that have Bluetooth) I can: Register our mobile phones to the Uniden's base station; Leave them inside, where they will stay clean and dry (and not be lost - I almost potted my Treo in with some coleus once.. but that's a story for another time); and finally, carry ONE handset (the Uniden, which is cheap-but-rugged enough to ride on my belt (with the included belt clip)) out in the yard. Incoming calls on any line will now ring through to the Uniden handset. Now that's handy. I feel compelled to mention that it is this feature alone that distinguishes the ELBT 595 from it's smaller cousin, the ELBT 585 -- the 585 seems to have all the same stuff, including Bluetooth, just no CellLink. So if you don't need it, I'd recommend you save yourself $50 and buy the 585 instead. Btw, some boating folks are excited about this feature of the phone too -- full of big ideas about hooking their mobile phone up to an amplifier antenna and getting crazy range, then leaving it all safely stowed in the bulkhead, safe from salt, loss and corrosion. While they carry the cheap (well, about $160 for a replacement) handset around on the waves. And you can marry a large number of handsets to the same base station, so the whole family can monitor incoming calls from the poop-deck. Ah progress.. The Uniden feels solidly built, especially the base-station. There's a satisfying finger-feel to all the controls and buttons. The handset feels a little less solid, a little plastic-ey to the touch, and I'm not convinced that the flip-phone style hinge will hold up indefinitely. I'll report back if it fails. I'll reserve my biggest criticism, however, for the phone's industrial stylings. Lookit that picture, above, and tell me that 'Norelco' isn't the first thought that springs to mind. I almost thought that 'self-cleaning and knick-free' should've been selling points on the box. So, points off for the looks. But just minor points. Enough to keep me from giving the Uniden ELBT595 a full five stars. But not enough to keep me from loving it. This page contains an archive of all entries posted to Soldier Ant in the Product category. They are listed from oldest to newest.